This month's Photo Assignment displays the work of 13 participants from The Digital Story community. The following shots are their interpretations of the theme, "vertical." This assignment was a tall order, but our crew was up to the task. "The Road to Nowhere." You can learn more about this shot, and the others that he took for the vertical assignment by visiting his website. 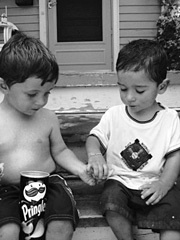 Photographer Geoff Hankerson says, "What signifies friendship more than sharing?" He captured this shot with a Canon PowerShot A70, then converted to B&W using the channel mixer in the GIMP. Geoff's shot is one of eleven featured in this month's TDS Photo Assignment titled "Friends." You can see all the entries by clicking on the Read More link. The Photo Assignment for April 2006 is "vertical." If you'd like your shot considered for publication, send it in by April 30. For more information, see our Submissions page. This month's Photo Assignment displays the work of 10 participants from The Digital Story community. The following shots are their interpretations of the theme, "fur." Great job with a difficult assignment. Took Patches' picture in my home studio, She jumped up on my new black background. (Well so much for not having any cat hair on my background.) Shot with a Nikon D-70 at 1/25 sec f 16.0 iso 200, used to White Lightning lights. I bought a Tamron Macro lens (90 mm f/2.8, focusses to 1:1). For this shot I used an indirect flash and a tripod. Did I mention that my cat is pretty lazy, and really patient? The trouble is though, these macro lenses have a really shallow depth of view at short range, and my cat prefers to keep on breathing (I asked to hold its breath, but alas...). 1/60, ISO 400, f/4. Well, this proved to be a tough one for me. I had a hard time coming up with an idea until I met my neighbors. Then, I needed to schedule the shoot with the teenage girl and her "Furends." The last day before the assignment deadline, I was able to get them all still together for this sweet moment. Meet Radha (the teenager), Chota the rat, and Koonti the Rabit. A sweet trio. Captured with a Canon PowerShot A80. Tamron SP Di AF 90mm, 1/60 of a second, f/4, with indirect flash. I was struggling a little with this assignment, trying to be a little creative and not do the "norm," since I do have cats and dogs around. While attending the Nebraska Winter Photography Workshop, we had a photo opportunity/lesson with a rodeo cowboy and his wife, and of course their horses. Olympus C750UZ, 1/200, f/3.2, ISO100, 33mm focal length. I had been trying to find something furry in my house, and finally found the answer under my feet, so to speak. Took the picture in my living room with morning light streaming in the window. I like the way the light played off the furry top of the slippers. Canon PowerShot S45, flash turned off. When you suggested "fur" as the theme for the assignment, I knew right away that our dog would play a part. She sheds. ALOT. This picture shows her with one week's worth of her shedded fur -- from just one room in our house. This was taken with my Digital Rebel XT in Program mode, and an external flash bounced off the ceiling to help soften the light. Fur... most folks probably don't often first think of seals as 'furry,' but they do have beautiful, luxuriant fur, covering all that blubber! The Photo Assignment for March. 2006 is "friends." If you'd like your shot considered for publication, send it in by March 31. For more information, see our Submissions page. Thanks again to all who participated. This month's Photo Assignment displays the work of 11 participants from The Digital Story community. The following shots are their interpretations of the theme, "ice." Terrific work, all of you! I had no idea you were going to do this assignment when I made the shot. While on vacation in Switzerland, we went to a glacier at the end of a valley (this is the Roseg glacier). Some peices of the glacier had broken off, and were floating in the lake in front of the glacier. The shot was taken at iso 100, f/4.5, 1/100 of a second shutter time, focal length of 78 mm with the Sigma 55-200 mm lens. I went out right away and photographed the ice, for me ice has always been icicles. Perhaps its the memory or our winter holidays in at various ski towns. Invariably my brother and sister and I would go out in search of icicles. These were the wonderful swards of winter, the crystalline blades would glint in the sun and ultimately shatter in our battles. However here in Italy our house does not make such long and luscious icicles, only small ones from the drain. The long ones of my childhood were created from the redwood cabins roof and our warm fires within. But with a bit of looking and fantasy I found a small icicle that would do. I hunt from a boat with friends, mainly on weekends and at public lakes. During a down time, my friend was outside of the boat walking around, walked up to the tree branch and said "Look! There is a decoy in there," and was about to break the ice to get at it. I stopped him so I could take a quick snap shot, which you see the results here. It was one of those moments that I had not even seen the decoy because I was so focused on the thick icicles, and also shows why having a point and shoot along is handy. I was experimenting with a macro lens for the first time. I rented a Nikon 60mm macro lens for the weekend and this is one of the first shots I took. Just an ice cube in a glass. I didn't like the first shot so I changed the WB to Incandescent. Taken with a Nikon D70, 1/40 sec, f/5. The Photo I send was taken in Saig, Black Forest, Germany, at the 1st of January. The ISO at 1600 was a mistake, I had it there from the night before. And I hadn't really been back on track again then. I loved the blue cast from the light diffraction. I used a Pentax *ist DS with a Tamron 90mm macro lens. The settings were f 4.0, 1/180 sec, and ISO 200. I was walking in the park near my home and this leaf trapped in the thawing lagoon was striking. I took a bunch of pictures and this is the best one. There isn't much ice to be found in Memphis, TN...especially this year. It was almost 70 degrees today. I chose the elephant because he is used to the limelight (He's from Barnum and Bailey's Circus). Taken just after he shot water out of his trunk. Nikon D50. Here's a shot of new ice on our local hockey rink in Bozeman, MT. I'm a player & coach - also Zamboni driver & ice maker. We just finished putting the final coat on, after 4 days of flooding, painting, flooding, line painting & more flooding. "emergencies". No fancy settings, just wider aperture to capture more natural light. The Photo Assignment for Feb. 2006 is "fur." If you'd like your shot considered for publication, send it in by Tuesday, Feb. 28. For more information, see our Submissions page. If you tuned-in to my last podcast, you know we've been kicking around an idea called "Photo Assignment." Well, we're kicking no more. It's a go. You can always refer to the details on our Submissions page. But I'll provide the skinnies here too. Each month you can participate in a photo assignment with other members of The Digital Story audience. The topic for the assignment will be revealed in the first podcast of the month. Then all you have to do is photograph your interpretation of that theme, and send it in via email. Title your subject line: Photo Assignment [month, year]. Attach your entry making sure that it is no wider than 400 pixels. Include a sentence or two about why you took this approach, the camera you used, and any setting details that you think are important. Address your email to: derrick@thedigitalstory.com. Each month at least one winner will be published on The Digital Story site. Sometimes multiple entries will be featured. You can review past winners by choosing "Photo Assignment" from our "Jump To" menu in the upper corner of the web page. Enter up to 3 photos for each assignment.